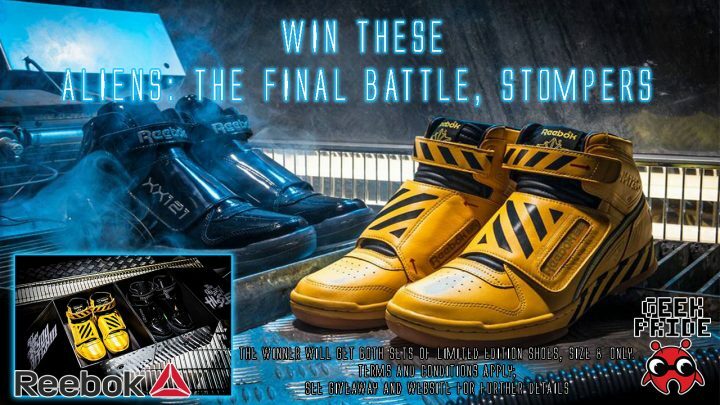 Want to win both of these Limited Edition Aliens: The Final Battle, Stompers worth over £350 ? Yeah ya do! NOTE: these shoes sold out on day one and so we have only got our hands on size 8s only, if this is your size great, if not then just display them, either way they are amazing trainers and well worth a place in your man/woman/nerd/geek cave. 2. Employees of Geek-Pride.co.uk or their family members or anyone else connected in any way with the competition or helping to set up the competition shall not be permitted to enter the competition. 6. Closing date for entry will be 31st Aug 2017 at 23.59 GMT. After this date the no further entries to the competition will be permitted. 10. The promoter will provide the Winner with the Final Battle set of Stompers, as shown, in size 8 only. 12. Winners will be chose at random using the giveaway ap. 13. The winner will be notified by Facebook Messenger, and or email within 28 days of the closing date. If the winner cannot be contacted or do not claim the prize within 7 days of notification, we reserve the right to withdraw the prize from the winner and pick a replacement winner. 14. The promoter will notify the winner when and how the prize will be sent out. 15. The promoter will use a third party courier to deliver the prize to the selected winner and will take no liability for loss or failure for delivery by the courier. 18. The competition and these terms and conditions will be governed by English and Welsh law and any disputes will be subject to the exclusive jurisdiction of the courts of England and Wales. 21. This promotion is in no way sponsored, endorsed or administered by, or associated with, Facebook, Twitter or any other Social Network. You are providing your information to Geek Pride and not to any other party.